Queen City for “Queen and Country”! 14th Trial: Sometimes detail of the environment can be tedious, but you know it is essential and no matter how much you try, you cannot avoid it. Something more British came to Charlotte and I was ready for it! 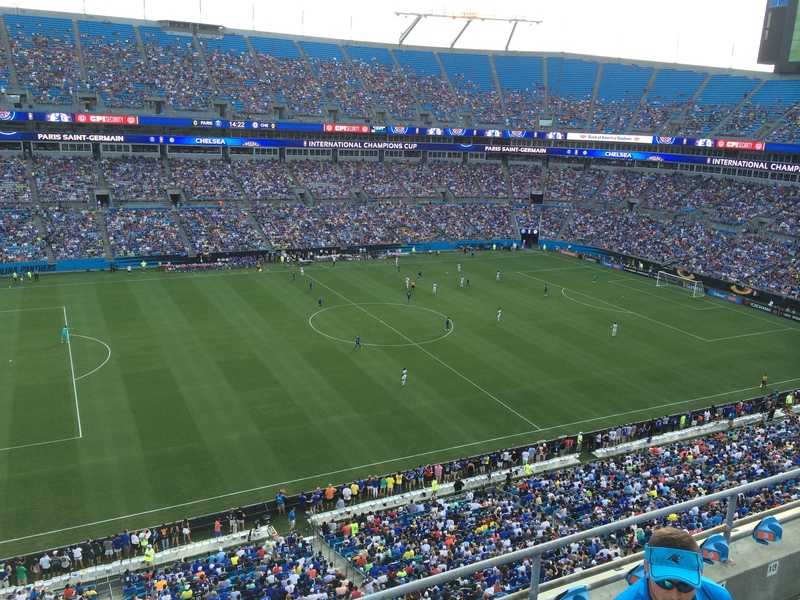 As you know, Charlotte is known as the queen city, and it blessed my weekend by the arrival of the Chelsea vs PSG soccer game. I had never watched a live soccer match at that level of skill, and it was incredibly fun. The crowd “oo”ed and “aww”ed with fancy foot work in unison, very polite and proper-like, much different than the belligerent noise of American Football (at least from my experience). I kept my Manchester United jersey at home out of respect for Chelsea, being a Chelsea fan for the day. I did however wear an England jersey, thinking something more British would be something more accepted! A man from Wales afterwards said that it is not proper to wear another country’s jersey, as only the English should be allowed to wear their emblems with pride. I told him to “bugger off” in an accent of course (that is a lie. I wish I did. Oh in retrospect!). One thing that I found enjoyable as well, is the fact that many situations I find myself in can be relatable to the act of writing a novel. A soccer game, for example, shows a team on field, working in a sort of dialogue between them. Some respond to other’s passes, some miss the shot entirely, and like any antagonist, some slide tackle to gain control of the game. I have a scene currently with the main character in a large group of people. How do they all respond to each other in the room, moving with or against one another, as if the focus of the moment was a circle of people juggling a soccer ball. Even more so, the impressive foot work and moves to pass in a tight space can be strategically described in literature’s attempt to have all the character’s dance around one another with their unique attributes and abilities. Posted on July 27, 2015 September 23, 2015 by KLMcCarty	This entry was posted in Uncategorized and tagged Dialogue, soccer. Bookmark the permalink.